As China has become the 2nd largest economy in the world and 11.3% of the nation’s households have reached middle class level with an average annual income of RMB40,000-200,000 (US$6,000-30,000), more and more Chinese have been aware of the importance of well-being and fitness. The health club market has since become huge in China now. With the Chinese middle class population keeping fast growth, 44% increase per year since 2008, it is foreseeable that the health club market will have great potential in China. However, compared with those developed markets, the health club business in China is still very immature with many of the players struggling to survive. Now let’s take a close look at the market landscape. As of 2010, China has about 3,000 health clubs, with about 3 million active members, annual membership fee mainly range from RMB 600 yuan (US$ 91) to 5,000 yuan (US$ 762). Geographically the market is highly concentrated. Up to now most health clubs in China are in 1st and 2nd-tier cities, very few in 3rd-tier cities. Beijing and Shanghai have far more clubs than other cities. But fitness markets in western China have shown robust growth in recent years, as the government encourages economic development in its “Go West” policy. Currently, commercial gyms dominate the Chinese market with about 86% of the total number of fitness centers. Hotel gyms comprise about 10% of the market, while public gyms lag well behind in terms of expansion into the market. When the Chinese health and fitness industry took off on a grand scale in the early 2000s, the focus was on Beijing and Shanghai. Residents of these cities have higher incomes and are generally more health conscious than those in other parts of the country. In 1995, the Chinese government launched its “Nationwide Physical Fitness Program”. Over a decade later, the Beijing Olympics galvanized people to take up physical activity in the face of a growing obesity problem caused by rising wealth, changes in diet, and increasingly sedentary lifestyles. White-collar workers now recognize the importance of exercise and fitness. These factors should spell success for a well-run commercial gym but, in reality, many gyms are in trouble. Short-term cash flow is prioritized over member retention. Some gym chains have been expanding rapidly in the hope that scale will translate into success. The number of gyms operated by the top five fitness chains in China increased by 35%, year on year, in 2008. The two largest gym chains in China: Tera Wellness and Hosa Fitness were founded by entrepreneurs from China mainland and Hongkong. Tera Wellness is based in Shanghai, while Hosa is based in Beijing. International gym chains: Most have struggled to find their place in the market. However, Bally and Powerhouse Gyms, the largest international brand players in the China market by number of sites, are the exceptions. The former is a Chinese majority-owned joint venture, and the latter is owned by a Chinese master franchisee. California Fitness, which arguably revolutionized the commercial gym market in Hong Kong when it launched in 1997, only has two centers in China. Fitness First, another big global player, withdrew from the Shanghai market altogether, leaving it with a single centre (operated under a different name) in Beijing. Gold’s Gym also had a brief and unsuccessful foray into the China market in Shanghai. Regional gym chains: They have so far in a better situation than most international ones. Alexander Health Group from Taiwan, known as “Alexander City Club” in Mainland China, occupied its own space and had a clear brand proposition. However, the company sold its Mainland China operations prior to a spectacular collapse in Taiwan. Megafit is run by a Hong Kong company with an operations base in Shenzhen. Private equity firms have been investors in Chinese gyms and those around the region. Temasek, an investment company owned by the Singapore Government invested in Tera Wellness. Will’s Gym, based in Shanghai, has also benefited. However, the majority of the funds have come from other sources in the Mainland China market. Tera Wellness was founded in Shanghai in 2001. It is so far the largest health club chain in China with nearly 100 gym locations over 13 cities, 44 of its existing locations are in Shanghai. According to its official announcement, it will expand to 200 locations by 2011. In 2007 Tera Wellness acquired a $20M investment from Temasek, an investment company owned by the Singapore Government. Currently, Tera Wellness has over 3,000 employees in China. 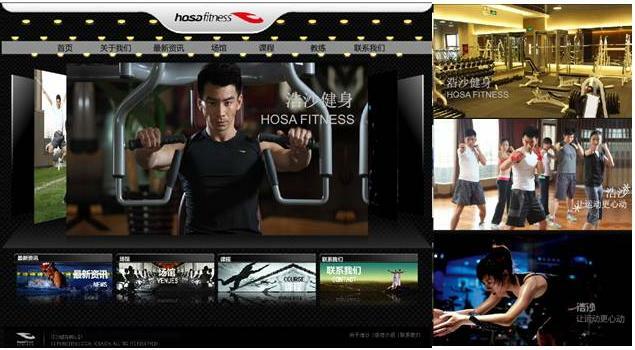 Hosa Fitness was founded in Hongkong and currently based in Beijing. It acquired the Beijing based Hokay Fitness’s total 51 clubs in 2009 and became one of the top two players in China’s health club market. Currently it has about 70 locations across 7 cities in China, 36 of the locations are in Beijing. China’s Shanghai and Beijing have the world’s No. 5 and No. 6 health club market potential/latent demand among all cities globally in 2009. But the reality is that for Chinese cities like Shanghai and Beijing, the actual health club market revenue is far lower than the potential demand yet and many gyms are in trouble. 1. It is still a long way to go for most Chinese citizens to take fitness as a regular part of their daily life. Although there is an increasing awareness of well-being and fitness, there is still a large gap between the awareness and the action. In a word, like any other change, the lifestyle change in the 1.3 billion population nation takes time and inspiration and education are needed to speed up the change. Beware of Tera Wellness. Their sales people would say anything and promise you anything, but when you ask them to put their oral promises and guarantees in the contract, they would say they spoke too fast that day and those couldn’t be done. One I came across even asked me in return “if I didn’t say it this way, wouldn’t you not sign up for the membership”? Luckily I haven’t signed their membership consent contract, which states something like once you have paid and signed this document, your money is non-refundable. And for those of you who do not believe me, just try going to their website, look up for the complain hotline and call. You would be lucky if someone actually picks up the phone and speak to you! If you can read Chinese or know someone who does, just go google or baidu for this gym and you will be surprised on how unsatisfied most of its members are. Thank you HFTAN. I appreciate your sharing. Yeah, nowadays many of the gyms in China focus too much on the short-term cash flow at the expense at the long term brand building. Part of the reason is because most of them are struggling financially. Personally I feel sad for them, and I hope the situation will change in the near future.